Twenty-two Allards and upwards of fifty Allard owners, family members, and enthusiasts gathered at Watkins Glen on the 2nd weekend of September. Overseas visitors included Mike and Diana Knapman, David Hooper and Pat Lee from the UK; and Rob and Margie Boult from New Zealand. The event was SVRA’s U. S. Vintage Grand Prix, where Allard shared the honors of Featured Marque along with Alfa Romeo. Andy and Judy Picariello again did a fantastic job of promoting the event for the Allard marque, and making sure the myriad details got the proper attention. 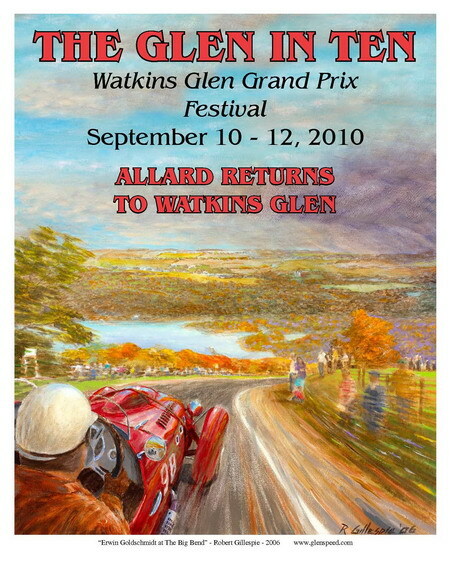 It was 62 years ago that Watkins Glen hosted the first post-WWII road race in the US. That was truly a ‘road race’ with the start/finish line on Franklin Street in the heart of downtown Watkins Glen. Most of the 6.6 mile course meandered on two-lane country roads through the hills just west of town. Irwin Goldschmidt won the main event 60 years ago with his Cad-powered Allard J2. That very same Allard had been proudly displayed at the opening of the International Motor Racing Research Center (www.racingarchives.org) in Watkins Glen, was at center stage in Allard Alley this weekend. Furthermore, it came to life and ran in Friday evening’s tour of the old Watkins Glen circuit. Bill Warner, founder of the Amelia Island Concours d’Elegance served as pilot, with our Guest of Honor, Bill Pollack riding shotgun. Bill shares more of that experience in his accompanying article. Bill entertained us at Friday evening’s dinner with several war stories of his experiences racing Tom Carston’s famous J2 #14 to victory at several races including Pebble Beach, Golden Gate Park, and Madera back in the early 50’s. After dinner Bill graciously autographed copies of his book Red Wheels and Whitewalls. The attached group photos show 15 Allards. However, after some detective work we finally determined that Allards present included six J2’s, five J2X’s, three K1’s, three K2’s, one K3, one L-Type, one Pebble Beach Mk II, and two J2X Mark II’s. Three Allards, in addition to the Goldschmidt J2 were of particular interest. The first was a ‘one-off’ J2 that we have been hearing about for years – David Hans’ beautifully restored, pontoon-fendered J2 that he found in ‘basket case’ condition in Peoria, IL. David has agreed to share an illustrated article on the history and his restoration of this car. The second was a J2 that our late friend, Glenn Shaffer, found in South America several years ago. He restored and raced extensively and aggressively on the West Coast in the late 90’s. Glenn got his ‘last checkered flag’ about 9 years ago in a manner that many vintage racer dream about. He was racing his Corvette at Sears Point when he unexpectedly pulled over and stopped, and had passed on before the course workers got to him. Glenn’s collection, including his J2 sold at Barrett-Jackson a year later, and was subsequently sold at another auction the following year. We lost track of it, and speculated that it ended up in a private collector’s warehouse. We were thus pleasantly surprised to see again after all these years. Our hats off to Alan Rosenblum of Utica NY, who exercises it on a regular basis. We were intrigued with Harold Haase’s story about his J2X which he had owned since 1955. He is a self-avowed Ford fan, so proceeded to replace the Cad engine with an Ardun Ford. Then, due to family and career priorities, he stored it away for the next 30 years until 2007. It is reported to be the only Ardun-powered J2X, and is in its original, well preserved condition. Harold drove his J2X the entire 500 mile round trip from his home in Connecticut. Two Allards were originally slated to race this weekend – Bob Girvin’s GT, and Bill Boone’s J2X. However, Girvin’s well-worn 392 hemi gave up the ghost at Lime Rock a few weeks earlier, and Boone was sidelined with some medical issues. But the plot thickens – for the race program showed a THIRD Allard, a bare aluminum skinned, flathead-powered J2 entered in the PREWAR class along with a flock of Alfa’s and MG’s weighing half as much. This car was pitted in a different area of the paddocks, and for various reasons we were not able to get much info about it. We were subsequently able to contact the owner, Peter Patterson, who states that he bought the car in May. Our friend, George Chilberg owned it until about 5 years ago when he sold it, sans the Ardun engine. According to Peter, it is currently equipped with a stock 85 hp flathead. This J2 has a single-beam front axle that had been installed some time in the early 50’s. We look forward to hearing more about this unique car in the future. Many of us are looking forward to getting together at the Amelia Island Concours d’Elegance the weekend of March 11-13, 2011 where Allard will again be honored as one of the featured marques. Allard owners, Axel and Hanko Rosenblad live in the immediate vicinity of Amelia Island, and graciously offered use of their garage facilities for Allard owners who are planning to bring their Allards. Special thanks to David Hooper and Peter Bowman for supplying their photos! Special thanks to Robert Gillespie for proving the poster art work for 'The Glen in Ten' Allard Reunion. For more info, please visit www.glenspeed.com.